Hello, hello! I'm sorry to say I'm going to have to be short and sweet today because I'm going a little bit crazy getting ready for the holidays. On top of that, Friday was my husband's birthday and I threw him a Surprise Party! It was so much fun and I can't believe that I was able to string him along for so long. I'll try to post pictures of that soon because it was also an ugly sweater party and our friends are pretty fantastic when it comes to dressing up (I mean, they're always fantastic but also fantastic dresser-uppers). 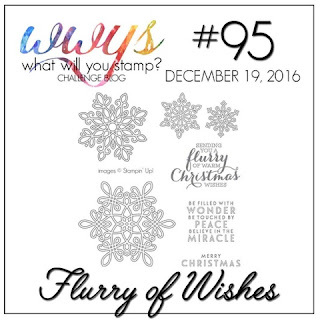 Today's card is for this week's What Will You Stamp Flurry of Wishes challenge... Yep, seriously. I don't have this stamp set so I stamped an image from a friend. I stamped the one that says, "Sending you a flurry of Warm Christmas Wishes." Then I fussy cut out the words that I wanted, "Sending You A," and I pieced them together to create the sentiment that I wanted for this love note card. Most of the products that I used are a sneak peek of the upcoming Occasions catalog! Take a close look-I love those little arrows that I cut out of Copper Foil! Be on the lookout for the new catalog which goes live at the beginning of January. I've got a stack of catalogs that are just waiting to get sent out so if you don't already have a demonstrator and you'd like your name to be on one of them please let me know! Here's a look at the Flurry of Wishes set. Do you see the sentiment that I used to custom make my own sentiment? For more fun ideas on how to use this set hop on over to the What Will You Stamp Challenge blog to check out what the rest of the design team has made to share! Alright, that's it for now! Have a great Monday and an amazing week! Thanks for stopping by my blog today!